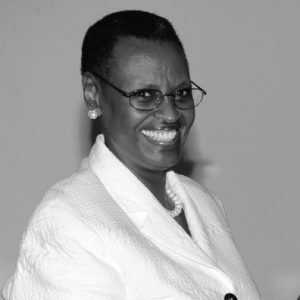 Janet Kataaha Museveni was born June 24, 1948 in Kajara County, Ntungamo District. Janet is the First Lady of Uganda and the Minister for Education and Sports. She is married to Yoweri Museveni, with whom they have four children and many grandchildren. She has a Bachelor of Arts in Education from Makerere University, a Diploma in Early Childhood Development from Sweden, and a Masters of Arts in Organizational Leadership and Management from Uganda Christian University, Mukono. She previously served as the Minister for Karamoja Affairs in Uganda’s Cabinet in 2011 and as the elected Member of Parliament representing Ruhaama County, Ntungamo District. Janet left Uganda for exile in Tanzania in 1971, when Idi Amin toppled the Obote I regime in a military coup. She returned briefly in 1979 after Amin’s regime had been toppled and her husband, then serving as Minister for Defence in the Obote regime, lived in Kampala. Amidst political uncertainty following the 1980 elections, Janet Museveni and her children re-located to Nairobi, Kenya, in 1981where they lived with friends until 1983. Shortly after, they moved to Gothenburg, Sweden, and stayed there until May 1986, four months after Yoweri Museveni’s National Resistance Army had seized power in Kampala. the Uganda Women’s Effort to Save Orphans (UWESO), an indigenous NGO which cares for war-related and HIV/AIDS-affected orphans in all the Districts of Uganda. The NGO has been in operation since 1986 and works with major UN agencies and other international donor agencies. National Strategy for the Advancement of Rural Women in Uganda (NSARWU), an NGO which works with poor rural women to empower them economically through various interventions. Uganda Youth Forum (UYF) and NGO that engages the youth of Uganda for purposes of character and behavior formation particularly with regard to HIV and AIDS prevention. Safe Motherhood Initiative of the Ministry of Health and WHO for reduction of maternal mortality and morbidity. She is as well the Co-chair of CURE Hospital – a special Hospital for crippled children in Uganda, with CURE International. She is also an Active member of OAFLA, an Organization that unites the First Ladies of Africa in the fight against HIV and AIDS in the Region. Above all Janet Museveni is a Professed and active Christian whose work and life is driven by principles of faith and divine driven purpose.